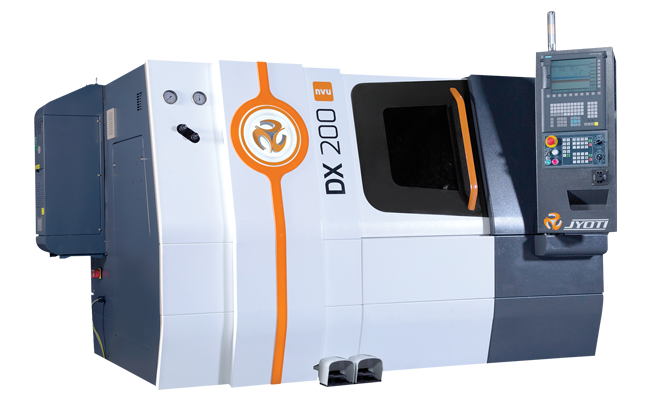 For revolutionary and competitive market DX 200nvu introduce with new aesthetic look and feature, which serves a platform to perform greater on high productivity and superior surface finish as it has derived from continuous development and innovation since Jyoti has begun to CNC machine tool manufacturing. The series is most demanding due to its rigid step-up structure and construction with versatile application which covers optimum dimension ranges ofworkpiece. Rigid bed and single piece 30° slant saddle construction. Rigid headstock & Heavy duty spindle. High precision L.M. guide ways. Bi-directional high speed servo turret. Fast tool changing time just 0.5 sec. Rear side efficient chip disposal.